Equipped with comfortable walking shoes, fresh water, and maps that are readily obtainable locally, you will be able to explore those routes that suit your preferences for environment, degree of difficulty, and duration. Some of the shorter walks can be combined. See locally available information brochures for more information. Here is just a sample of the many hiking routes from which you may choose. Click on any image to enlarge it. Hiking always involves some degree of risk. Hikers should obtain local information at the time of the walk, and should always leave information on their planned walks with a responsible person. This easy stroll starts in Oak Avenue (opposite the Village Green) and takes you through the arboretum and on to the 39 Steps waterfall. 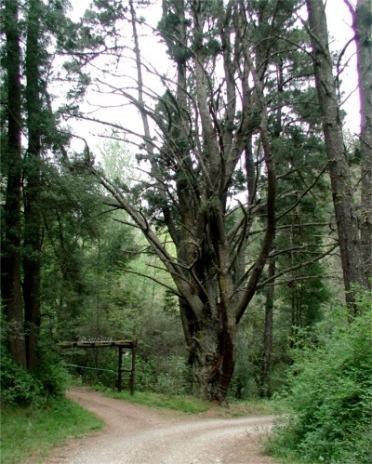 The arboretum is a garden of trees from all over the world, and includes several Californian Redwood trees, now well over 100 years old. All the trees have markers showing their botanical and common names. Another easy walk. 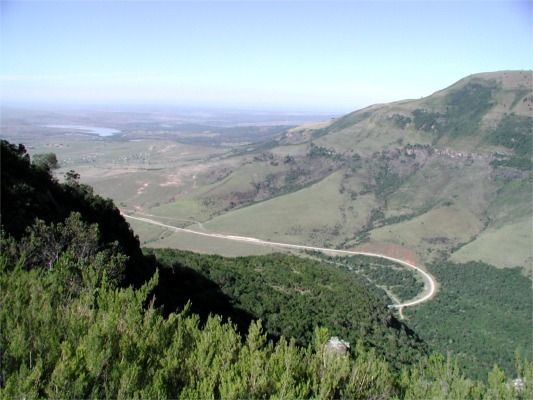 It takes you from Red Coat Lane (at the Village Green), into the indigenous forest, and links up with the Alice - Hogsback road some 2 km from the Village Green. British soldiers used this century-old path on their way between Fort Hare (in Alice) and Fort Michel (near Tor Doone). Look out for "Hangman's Tree" in Redcoat Lane - according to legend it was used for executing deserters in those days. This comfortable circular stroll along the Bluff offers spectacular views of the surrounding mountains and valley. Enjoy the Watsonias and Proteas in spring, and other wild flowers including the yellow iris (Moraea spathulata) and the unusual yellow Crassula as well as Satyrium orchids in summer. With a little bit of imagination, an outcrop of rock on the face of the falls helps to form the shape of the "Mother and Child" - hence the name of the falls. 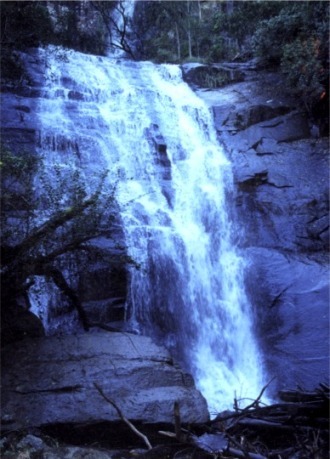 Madonna and Child falls can be reached via a moderately steep downhill walk from Wolf Ridge Road (4 km from Village Green) - or by a longer route from Main Road, via the Big Tree. Both routes take you through the indigenous forest. 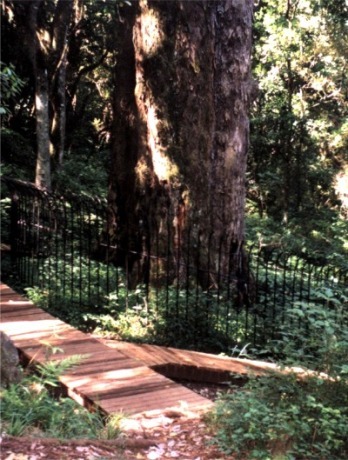 Walk from Main Road to the Big Tree, an 800-year old Yellowwood in the indigenous forest. The Narina Trogan, Orange Thrush, Bush Cap and other bird species have been spotted around here. 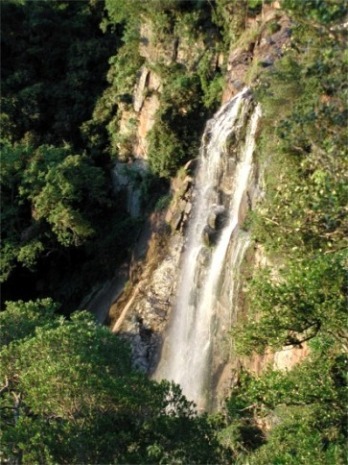 From the Big tree you can return to Main Road, or walk on to the Swallow Tail Falls, the Bridal Veil Falls, and Madonna and Child Falls. Kettlespout Falls can be reached via several alternative starting points and routes, depending how long you want the walk to be. Under the right conditions - good flow of water, with the wind blowing strongly in the right direction - the water is blown as much as 5 meters upwards before coming down in a spray of mist. A spectacular sight.